Sometimes you wonder if you need to upgrade your hardware to speed up the rendering process so you can flipbook aka preview the shot in motion. If you are not critical with the image quality of the preview, you can toggle Proxy mode in Nuke which either halves (well 1/4 to be exact) the project full resolution OR based on the size that you configure in your Project Settings so Nuke can render the shot faster. Where can I toggle it? As shown in the header image, it is located next to the Full Frame Processing icon in the Viewer. If you are using older version of Nuke, just look for the two rectangles icon. Another area that you want to look for is the Project Settings (default shortcut: S). You can change the Proxy mode to either format or scale. If you are using format, you can choose from a list of formats. Just remember to use smaller formats than your full size format. For scale, you have a slider which is defaulted to 0.5. How can it impact my workflow? For starter, It is really useful if you need to make sure the animation timing is correct. Although be warned that Proxy mode do cause issue with certain nodes that requires the full resolution from my experience in using it. One example will be any keying node where the generated matte will looks slightly off compared to the full resolution. This might freak you out if you wondering why your matte edges didn’t align properly with the subject. Also nodes that utilises 32-bit floating point data like ZDefocus will look off too for the finer details. Use it if image quality is not your main concern when previewing a shot as it really speed up the rendering time a lot (especially true if you are CPU bottlenecked). 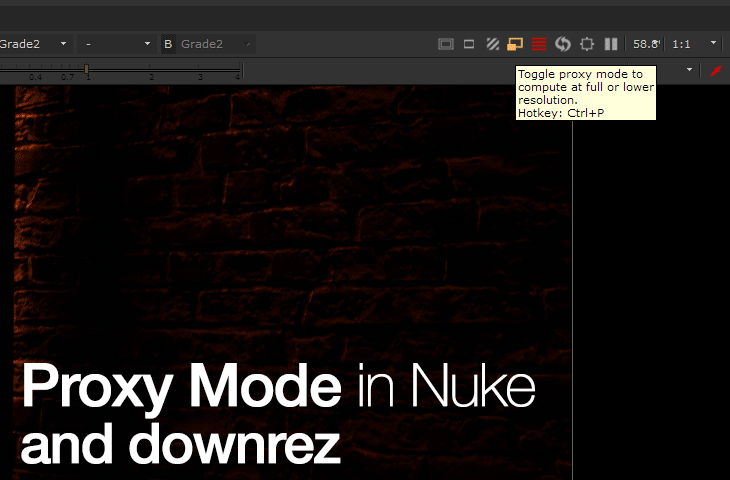 Other than proxy mode, you can also configure Nuke to downrez the project if the script is really really heavy to render on your workstation. To downrez, look for the 1:1 dropdown menu at the Viewer toolbar (the most right side of the toolbar as seen in header image). You can refer to the GIF below for example on how both Proxy and Downrez works. Remember, Proxy mode affects Downrez too further reduce the amount of pixels being rendered. Take note that the default setting for Proxy mode has been switched to 0.5 scale starting Nuke 9 (which I think is better than using the prior 640×480 resolution).